Did you know that geckos need sticky pads on the bottom of their feet to climb up the sides of buildings? But because of all of the newly developed shiny surfaces in our urban environment, geckos have actually evolved to have stickier pads. But it is not only those geckos that are evolving quickly. There are some new faces in the Grants, Engagement & Communications team aka GECo and we would like to introduce you to Sophie Arthur and Lucy Brown. It has been a year since Dr Jenna Stevens-Smith joined the LMS as Head of Grants, Engagement & Communication team. The team has evolved and have big ambitions for communications and engagement at the LMS. In this article you will find out more about the two newest members of the GECo team, Sophie and Lucy. Sophie is the LMS’s new Science Communications Officer. She studied Molecular and Cellular Biology at University of Bath completing projects in seroepidemiology for Public Health England, molecular embryology and bone regeneration technologies before embarking on a PhD. Sophie recently completed her PhD at University of Southampton before joining us where she specialised in stem cell metabolism where she focussed on how glycolysis, hypoxia and epigenetics collaborated to maintain pluripotency in embryonic stem cells, and compared those mechanisms with cancer stem cells. She also is celebrating her first publication in Stem Cell Reports on 14 March which provides insight into whether metabolism drives a stem cell state under hypoxia, or whether the glycolytic phenotype associated with pluripotent stem cells is a characteristic of pluripotency. Lucy is the most recent addition to the GECo team and is the LMS’s new Engagement Project Manager. She studied Natural Sciences at Durham University with a year at McMaster University in Hamilton, Canada doing science communication doing some work for the Discovery Channel and CBC alongside public talks and outreach. She specialised in three areas; biology, psychology and anthropology. Lucy’s previous research looked at how animals are evolving in the urban environment, the role of the gut in contributing to the ‘good genes’ hypothesis and the evolutionary reason why we find personable stories interesting and more memorable. After graduating, Lucy joined the Learning Team at the Science Museum as an Explainer presenting shows and demos in the interactive exhibits and exercising a passion to learn new things and communicating that with the public. She also has more presenting experience through working with the InScience Film Festival and the Tate Exchange. Lucy’s areas of expertise also include a social media internship for the charity Save a Child’s Heart, and as the volunteer coordinator for New Scientist Live where she developed training workshops on how to communicate science accessibly. Lucy hopes to put those presenting and communication skills to good use by creating educational science videos in the near future too. Sophie discovered her passion for science communication after competing in the 3 Minute Thesis competition and was the spark to many side hustles. She completed a digital marketing and a science communication internship alongside her research, has spoken about a range of topics in schools, community groups and at events such as Soapbox Science and bringing research to the public at Pint of Science events. She is also an award-winning science & education blogger winning two UK Blog Awards in 2018, and uses social media, primarily Instagram, to communicate science as well. As the Science Communications Officer, it is Sophie’s role to share the ground-breaking research with the world internally and externally through news articles, newsletters, social media and more. Lucy’s role as the Engagement Project Manager is focussing on two primary projects; A Picture of Health and the community engagement hoarding project for the new building. The Picture of Health project is in collaboration with Central Saint Martin’s where one student will be paired with a researcher to communicate their research and to explore what people’s interpretation of ‘A Picture of Health’ is. The hoarding that will surround the new building will be co-created with students of Ark Burlington Danes Academy school and will engage them in the development of the building and the research that will go on inside. 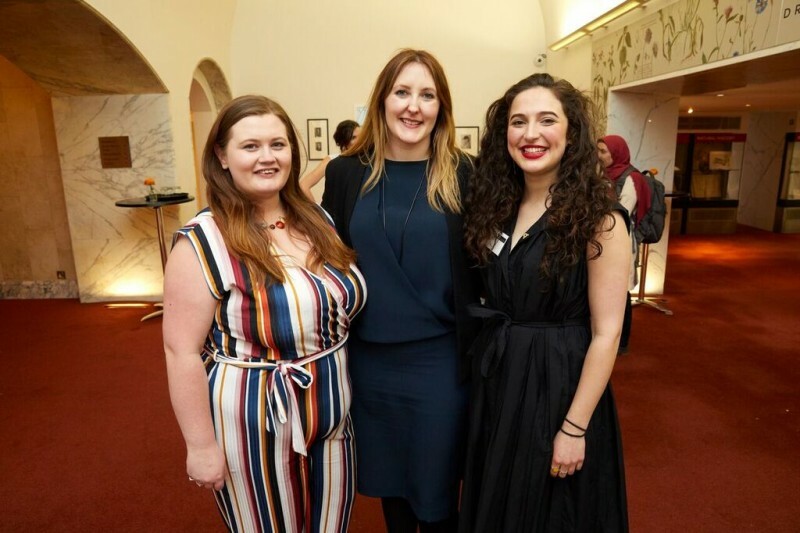 The combined experience, expertise and ideas from Jenna, Sophie and Lucy can work towards making the LMS a leader in medical sciences engagement and help the local and the wider public realise our medical science expertise. We are excited to see how GECo evolves further with many more communication and engagement opportunities coming your way. If you want to get involved in more public engagement activities, or have any outreach ideas, please don’t hesitate to contact any of the GECo team.